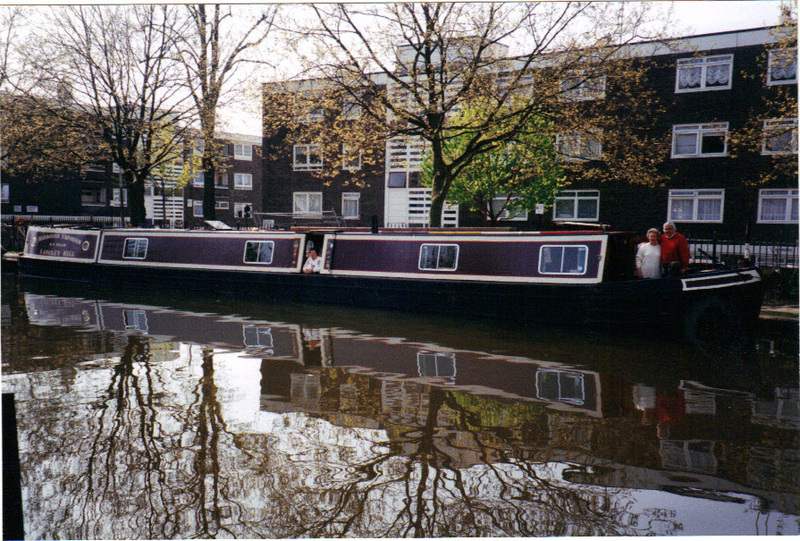 The other day I received an email from a relative of Willow’s previous owner, telling me about his memories of a trip on the boat some 15 years ago, whilst the boat was moored near London. 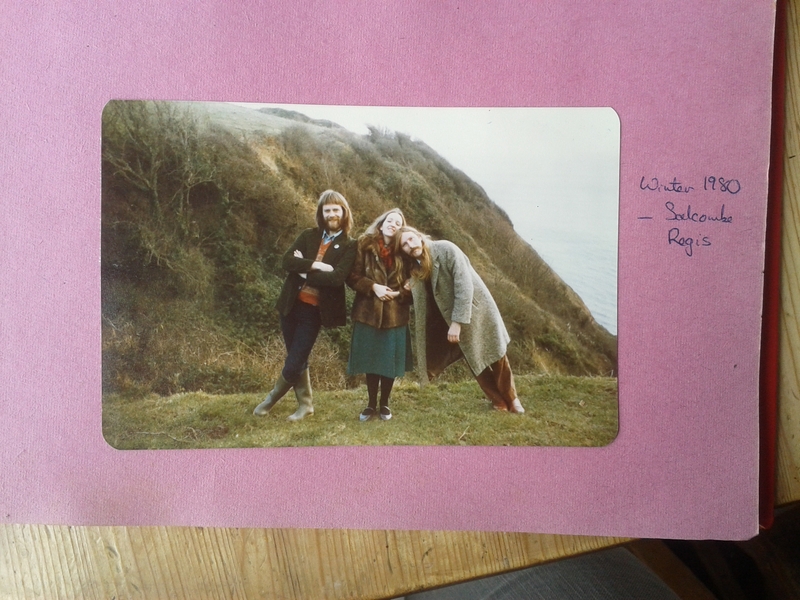 He included this lovely photo, of Willow at Little Venice. It looked quite different then, most notably the colour was a deep burgundy instead of the bright blue it is now. 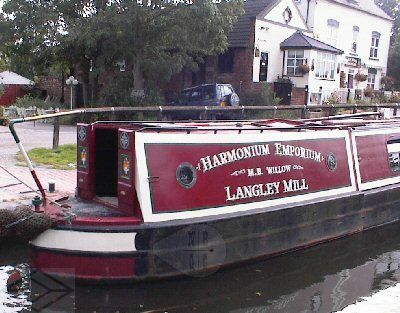 It was also signwritten with “Harmonium Emporium” above M.B Willow* and had its location, Langley Mill written below. * Willow was known as a “Motor Boat” when it worked for Severn and Canal, and all the Charles Hill Severners were signwritten with M.B before the name. Last night we connected up the shower waste with a length of pipe so that we could fit the whole tray in place and eventually connect it up. The wood supports have been treated with end grain protector, and the wood is pressure treated exterior grade. With a bit of wiggling and some difficulty we got the tray in place. It is very heavy so not easy to manoeuvre but we got there eventually. The sump box fits nicely next to it and so the next task is to attach all the pipes and the Gulper pump. Then we can begin making the shower cubicle! 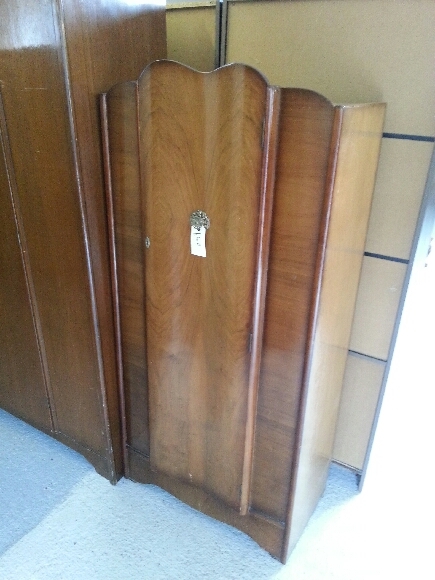 This beauty from Emmaus is now (thanks to John) safely stashed in our garage. We aren’t ready to put it in the bedroom yet – it won’t fit until we have converted our lengthways bed into a folding cross bed. But for £20 (they were having a half price sale) it was too good to pass up. 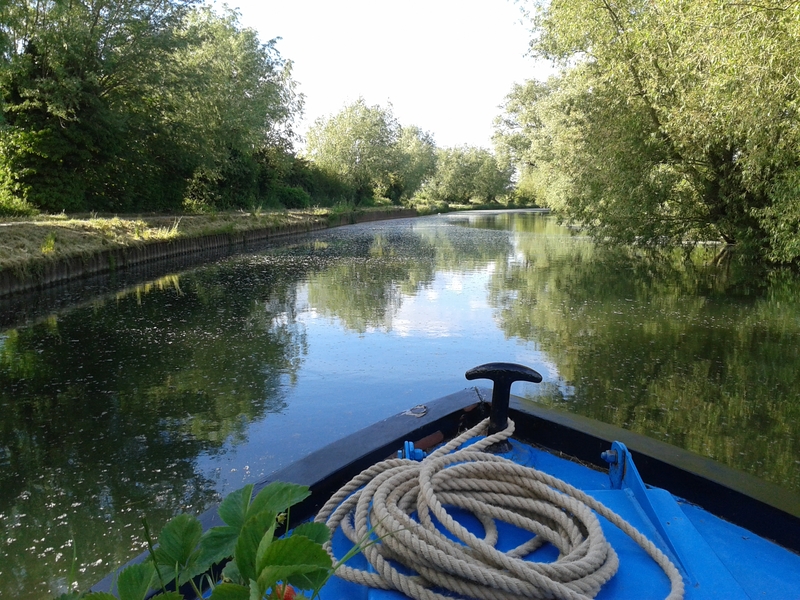 Fed up of the commute from the admittedly lovely Waterbeach moorings, we came back into town last night. I met James at Baits Bite lock, having cycled out there after work. I popped into the Conservancy office to pick up a new EA key (we have only one now as we gave one away with the Duck and wanted a spare), and was nabbed to sign and fill in a form for the river manager. 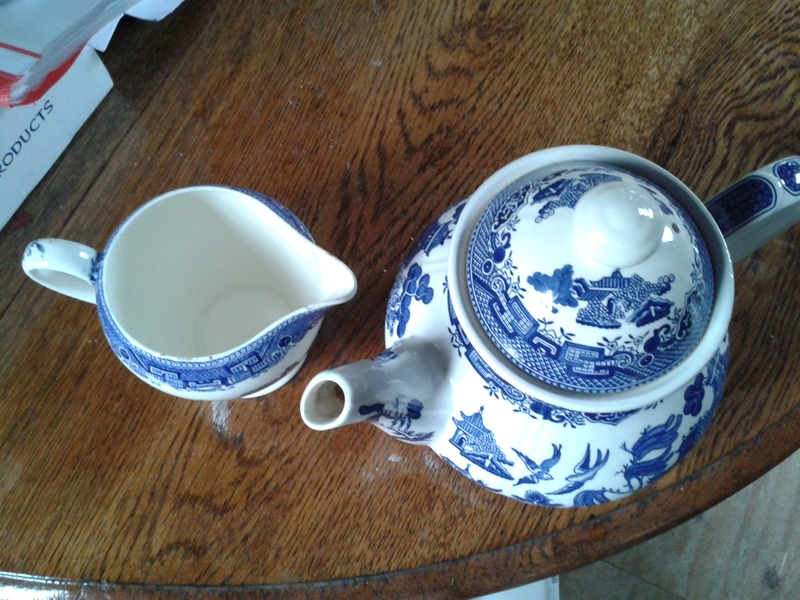 She did, however, provide tea and ginger nuts in return – there are some perks to being a Conservator! 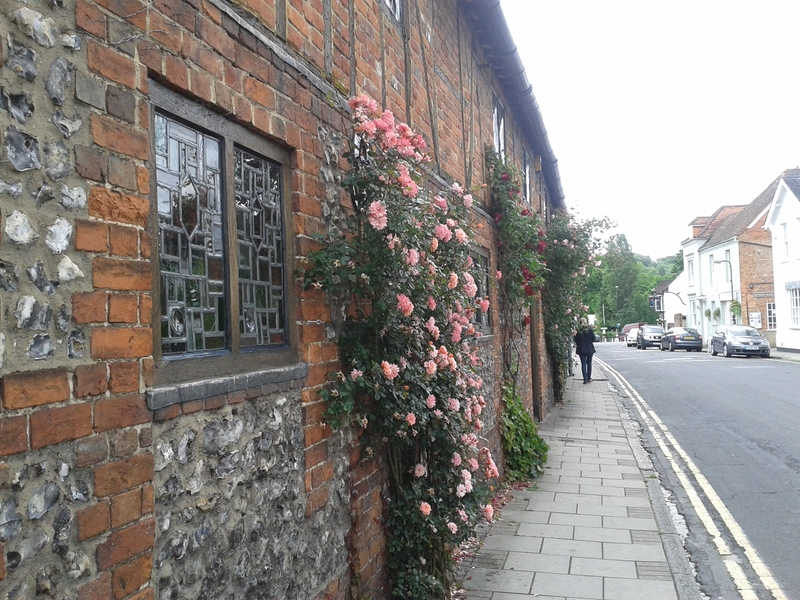 We moored up in time to go rowing and coxing, but decided on a whim to move to a slightly different spot on the Common – with the Fair in town everyone left, so that on our return we had our pick of most of the Common. The way our mooring works, we don’t have an allotted spot, just a licence to moor anywhere on the City’s riverside Commons. We are next to one of the set of concrete steps, always a bonus, aren’t under any trees, and only shaded by a little one for some of the day. Only a few hundred meters from where we were before the fair, but a different view from the window, always nice. Lyra seems to like it here too. Steerer’s eye view – a lot of boat! This year I raced at Henley for the first time – at the Women’s Regatta that is, not Henley Royal Regatta, which starts on Wednesday 3rd July. 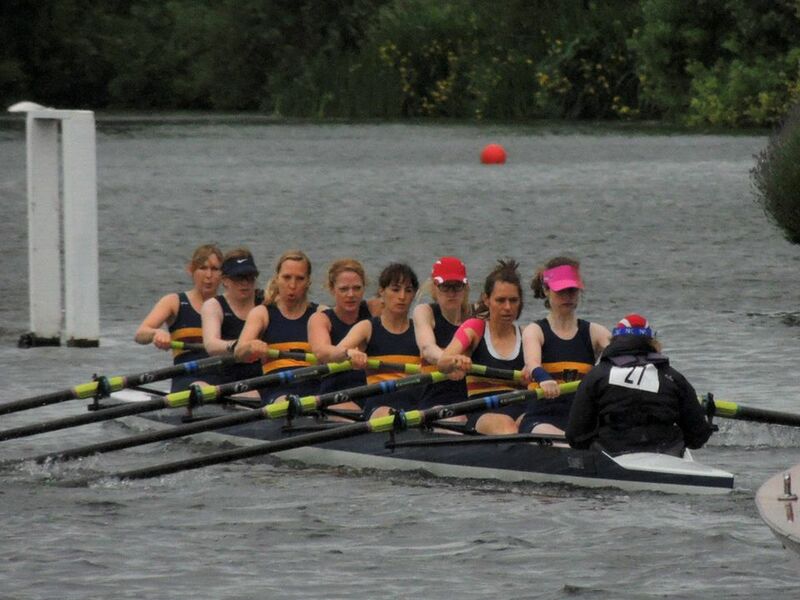 The regatta is, as the name suggests, for women only and is raced over 1500m of the 2km Henley course. I was rowing for City of Cambridge rowing club in the Club Eights category. We were lucky to have a “bye” through to the quarterfinals, and were up against Thames Rowing Club. 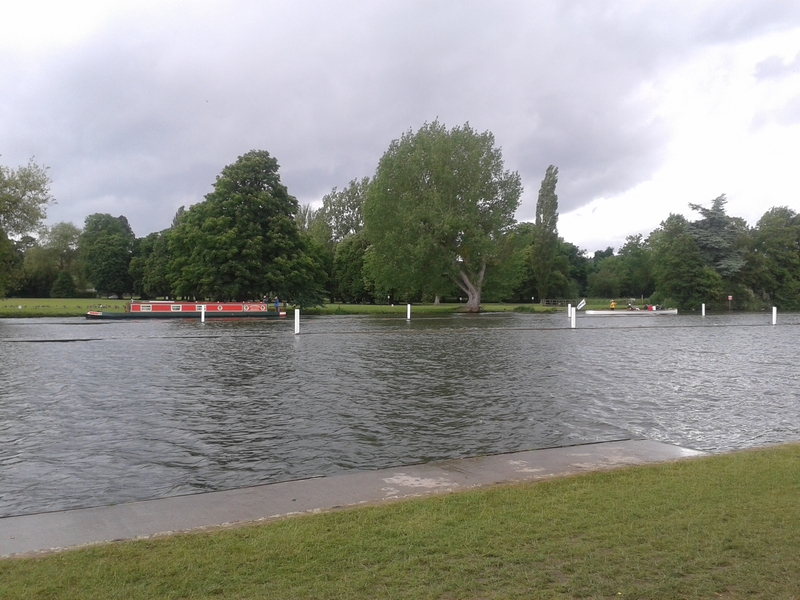 The conditons were dreadful – wet, windy and cold, but we went out and had what felt like a very good race against Thames. There’s a sequence of photos here. In the first few seconds we had the lead – one of them fell of their seat at the start – but they beat us eventually. We felt like we’d given everything and that’s all you can ask for. 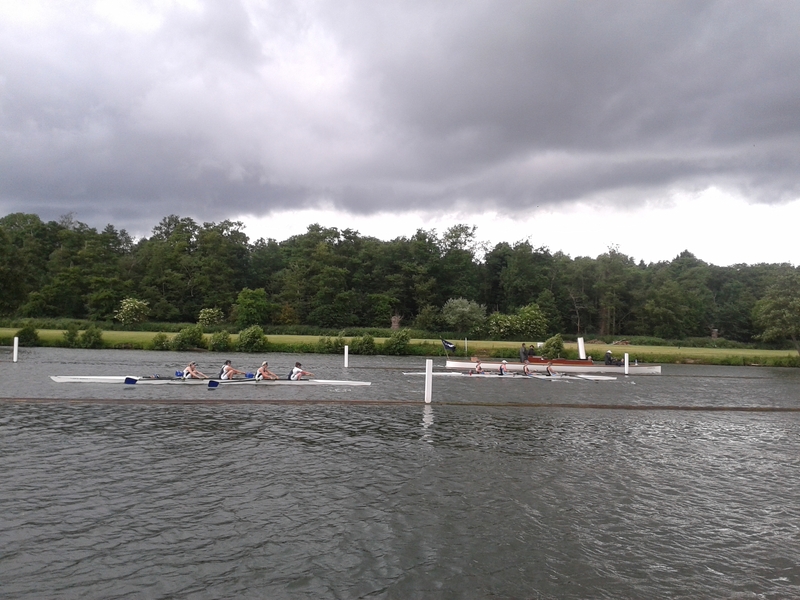 It was still really good to be there – the atmosphere is great, not stuffy or posh and there are no silly hats and blazers at this regatta, just people who are there to enjoy the actual rowing. It’s a beautiful location, and I particularly enjoyed seeing the wooden Umpires’ launches, especially the steam launch Consuta, built in 1898. Sadly our race was umpired by one of the diesel launches, but we did row past Consuta at one point and that made me happy! 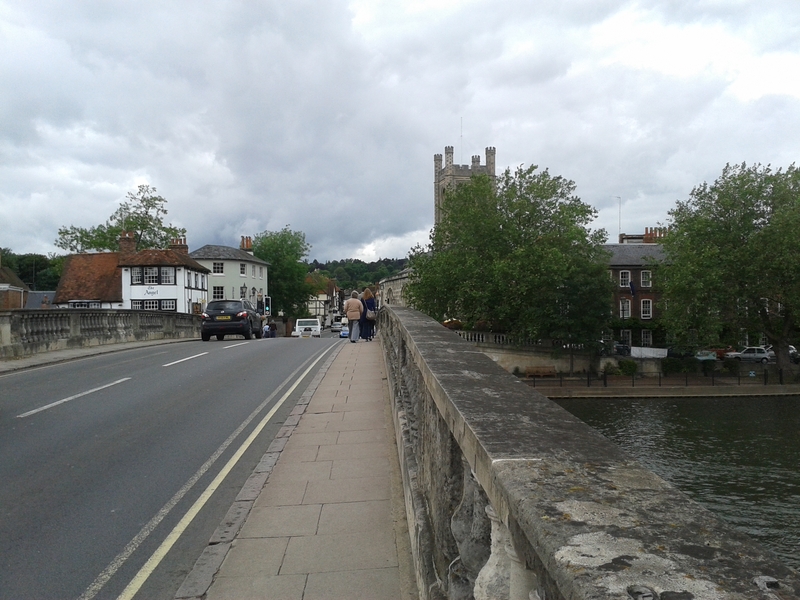 Afterwards I headed back through Henley town and had a quick browse through the charity shops there before catching the train home – there was certainly a higher class of clothes – lots of White Stuff, Hobbs, Jaeger etc. I bought a pretty top and some brogues, but I’ll do a separate post about them! 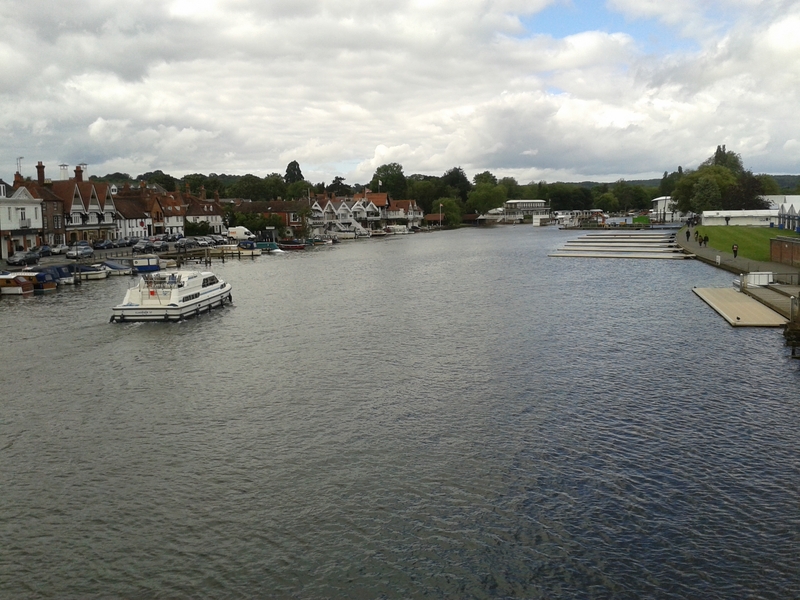 Over the weekend, I was in Henley, at the Women’s Regatta but I was back on Saturday evening and on Sunday we got on with the shower. 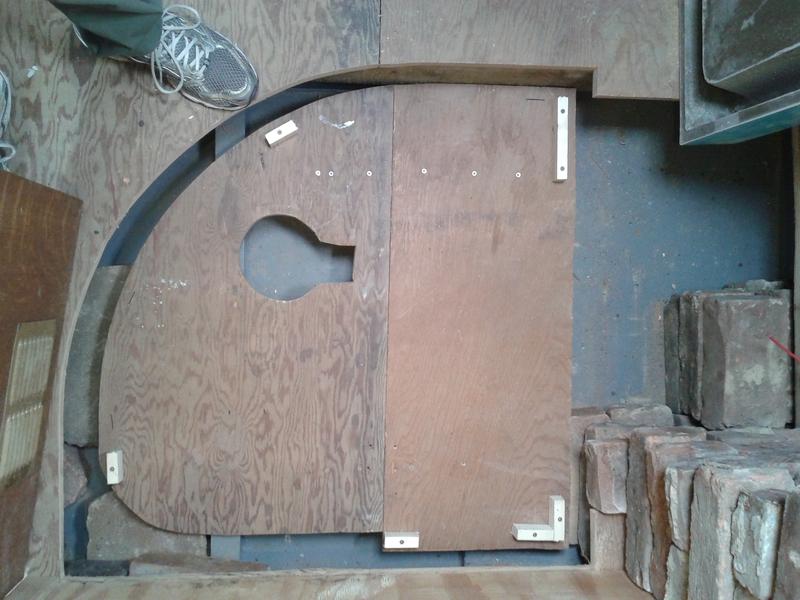 James had bought a shower waste, and we attached it to the bottom of the tray, then cut a keyhole shaped cutout in the piece of supporting ply. We’ve had to move the whole thing about 10 mm to avoid the waste fouling the keelson (A long ‘spine’ of steel which runs down the centre of the baseplate). The small blocks on top are to stop the tray sliding about. Supporting the ply itself, at 85mm above the baseplate, are lots of blocks of outdoor treated wood, which are also going to get some end-grain wood treatment. Having had problems with shower leakage on the Duck in the past, we want to make sure that any stray drips are contained, and don’t run into the rest of the cabin bilge. 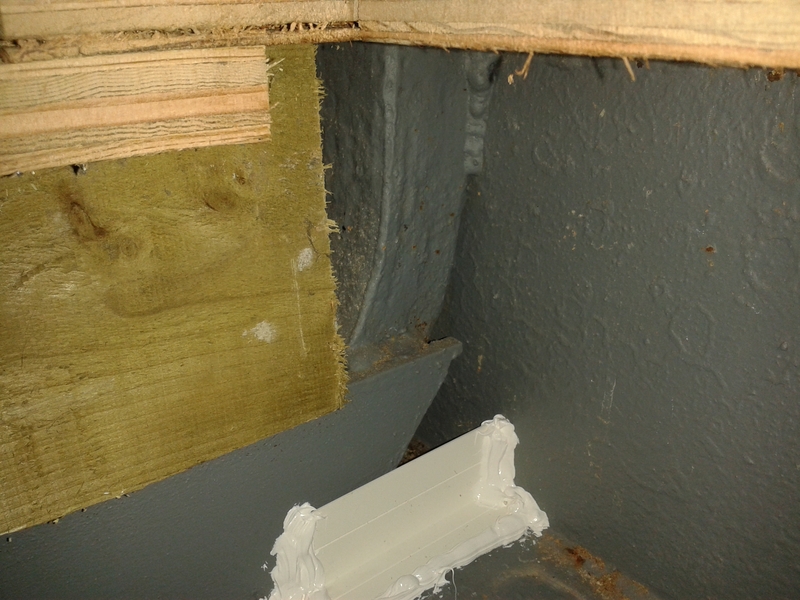 So, I sealed up the strengthening beam which had only been welded on in places, and closed up the drain holes. This area will also be accessible from the bottom of the cupboard next to the shower so that it can be easily checked and pumped out if necessary. Looking around under here, it is possible (see last photo) to see the boat’s knees (90 degree angled strengthening joints connecting the vertical hull sides with the horizontal baseplate, only found on historic boats) , which were retained when the baseplate and footings were replaced. On Sunday evening, after rowing and going out to Hartford Marina to sort a few things on the Duck, we set off from our Midsummer Common mooring in order to escape Midsummer Fair which starts on Wednesday, and goes on until next Monday 24th. 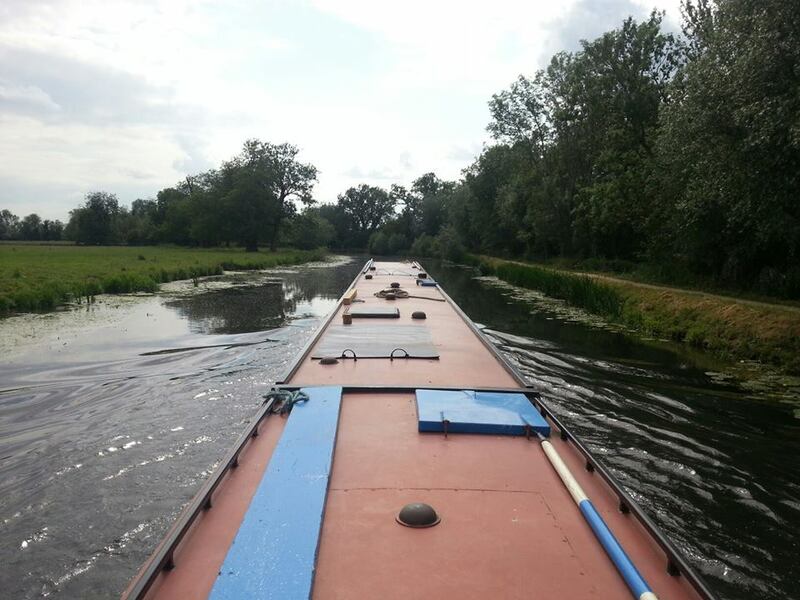 We moored up in Waterbeach, on the Clayhithe 48hr moorings and will stay here until Thursday (the rules about how long you stay here are relaxed during the fair). 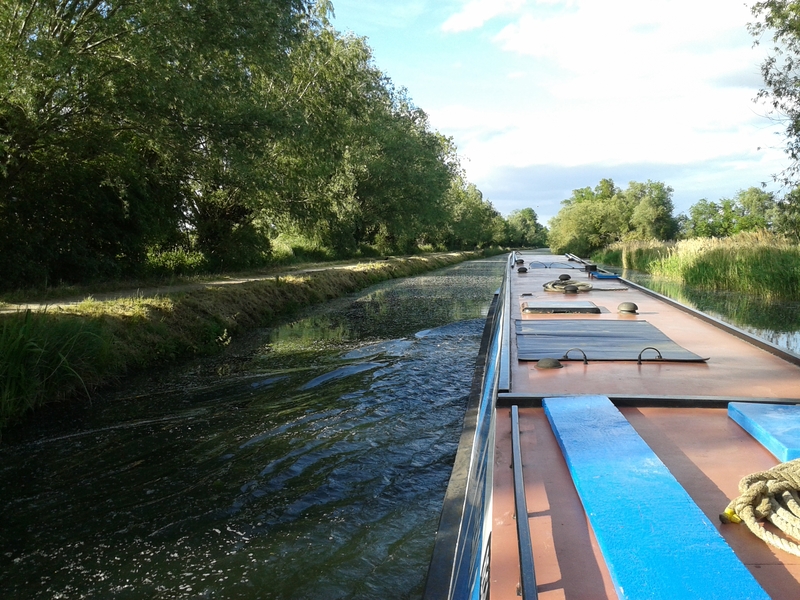 Then it’ll be on to Ely, or maybe just the GOBA moorings near Bottisham lock, we’ll see how we feel! It’s lovely being moored out here in the quiet of the countryside. As dusk falls, we see bats and owls flying about. A couple of photos from our trip out on Sunday. In the first you can see my strawberry plant which yielded its first sweet strawberry yesterday! P.S I’ve added some photos to yesterday evening’s fitout post, below. Spread out over two evenings. 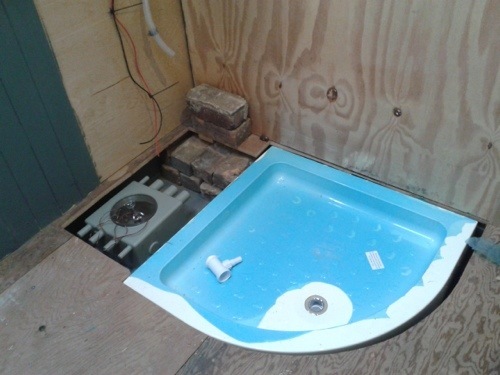 I’ve been working on the bathroom, in particular installing the shower tray. 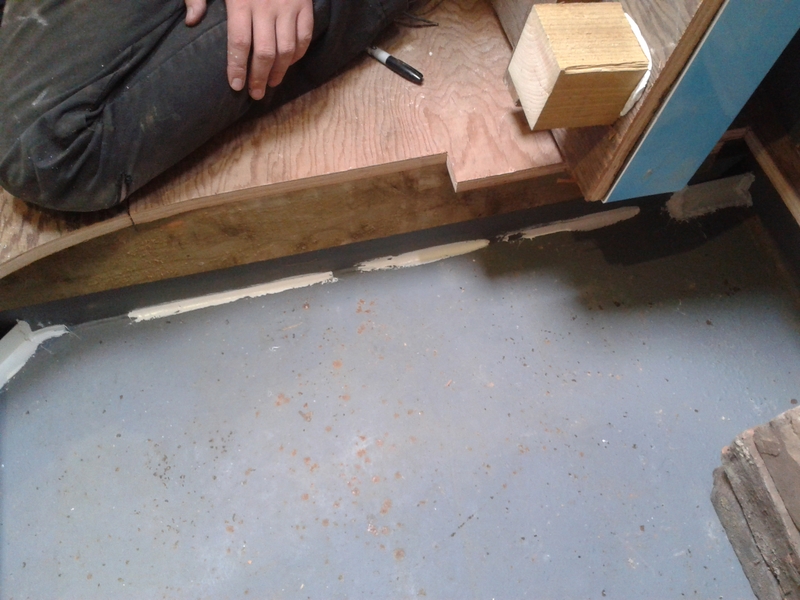 Whilst it would have been possible to have laid it onto the existing plywood floor and just cut a hole for the waste, there wouldn’t have been a huge amount of headroom. Although Amy and I, being fairly short, and used to a low headroom bathroom in Lucky Duck, wouldn’t have minded so much, we will have guests who are taller, and having more space to be able to properly get under the shower is always nice. So we decided to lower the shower tray so that it was below the level of the plywood floor, making the edge of it flush with the floor, and giving lots of extra headroom in the shower. It also means that the tiled floor can be mopped into the shower tray, and any water pumped out via the shower waste pump. 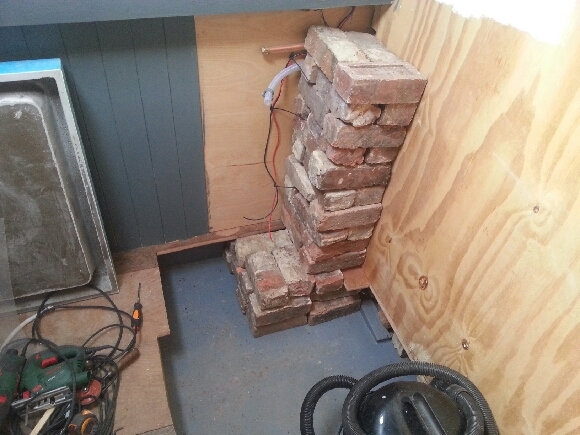 There is a 9″ deep bilge under the floor, much more than most other boats, filled with a double layer of bricks as ballast, so there was plenty of space to utilise. The first thing was to cut a hole in the floor to accept the tray. Laying it down, I drew around it, and cut around the outline with a jigsaw. 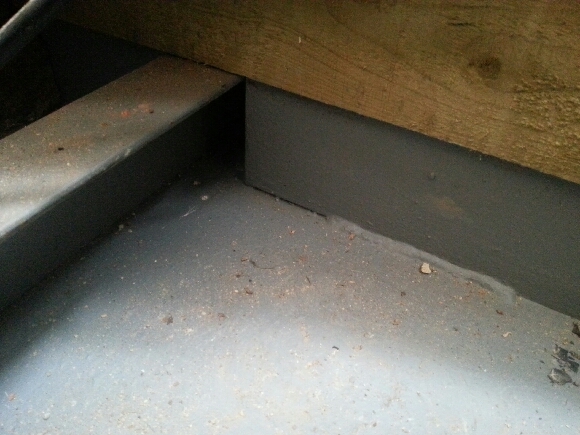 This took quite some time as the ballast is fairly close to the plywood floor. I chose an especially short jigsaw blade, and used the Bosch multitool to cut any particularly tricky bits. 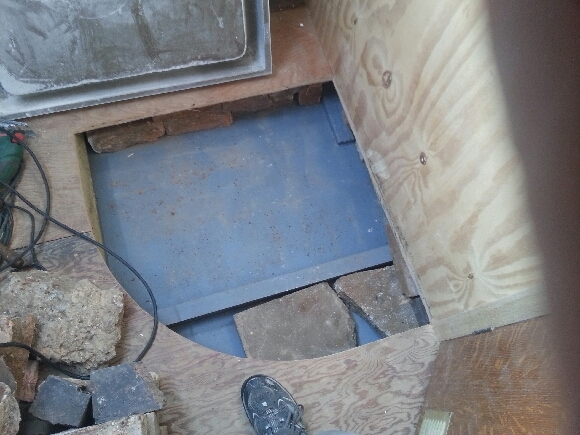 Once the hole was cut in the floor (the cut out pieces being saved to support the shower tray) I could access the ballast. 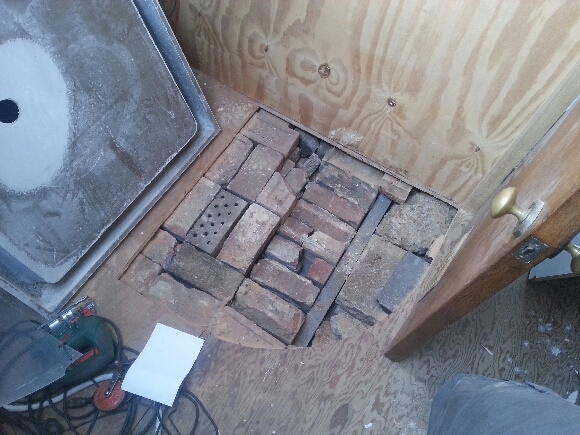 I took out all of the bricks that I could access, and cut another rectangular cut out next to that for the shower for the sum pump. There is a keelson made of 45mm angle down the middle of the baseplate, and transverse 45mm metal stiffening ribs, along with the original cast iron knees. Once the area had been vacuumed clear of sawdust and brick dust, I was able to look at the area. There is a horizontal stiffening piece across the baseplate just behind where the shower will go. We plan on sealing along the bottom of it and infilling some drain holes cut into the corners to make a mini bulkhead which will contain any leakage from the shower, enabling it to be easily pumped out should that be necessary. 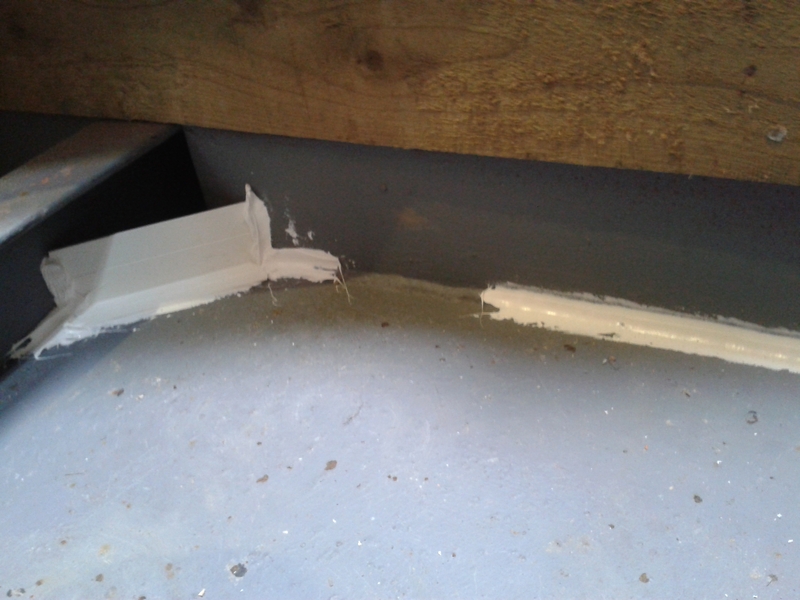 Some of the removed ballast was stacked up in the corner to correct a very slight list which removing it had caused, and this will be at the back of the bathroom cupboard out of the way where it can be easily removed or added to to correct the trim of the boat. 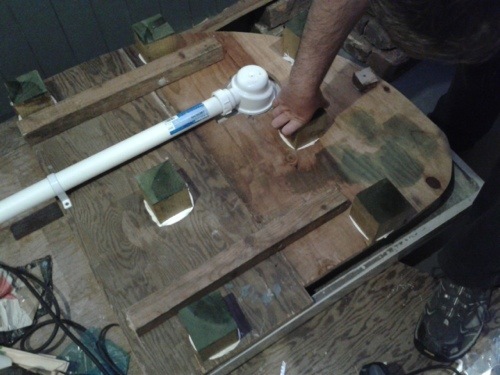 The plywood supporting the shower tray will be supported on one side by the keelson, which will have some small holes drilled and tapped through it to secure the plywood subfloor that supports the shower tray, but I’ve not decided how to support the other side. Any wood used might rot If it gets slightly damp around the bottom, requiring the shower tray and surround to be removed, so I’m trying to think of another way of supporting it. 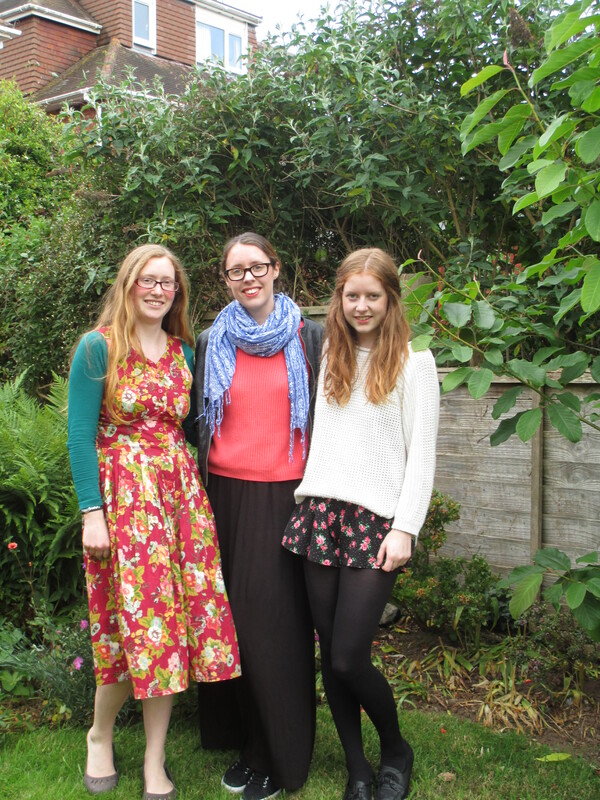 Over the weekend, my two sisters and I went down to Devon to stay with my mum to celebrate her birthday. 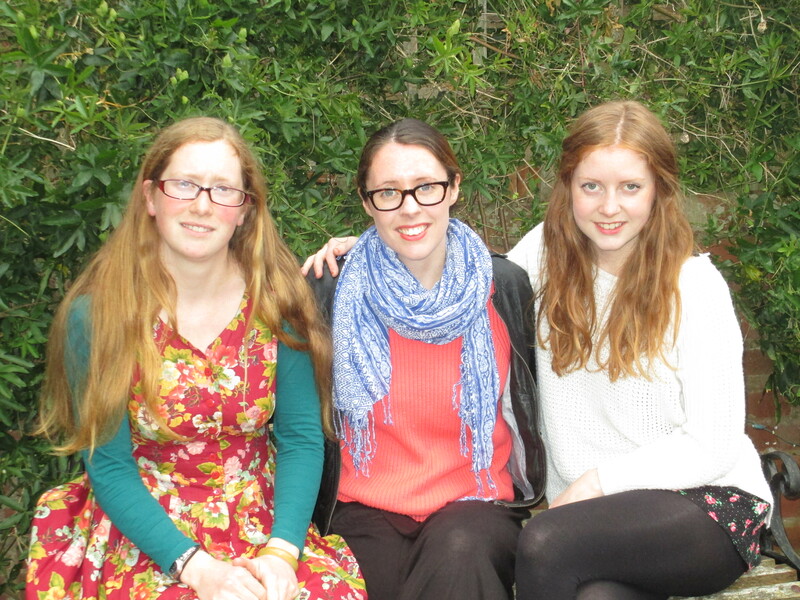 I am the eldest, Esther is the middle sister and Camilla (Milly) is the youngest. 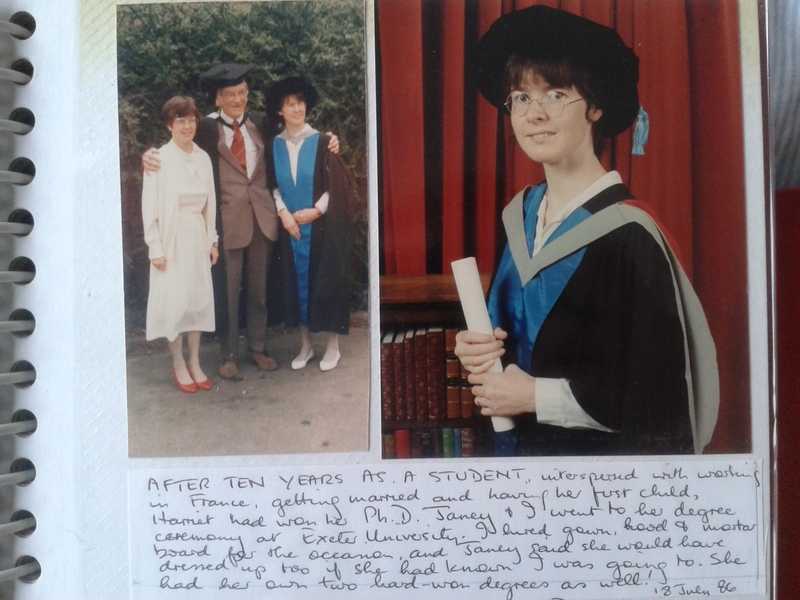 Esther also has a tough Medical French exam today for which she was revising and my mum speaks fluent French, so it was a good opportunity for her to practice. I arrived on Friday morning and stayed until Saturday as I had to make sure I didn’t miss too much rowing! I got an early train via Paddington, where I popped out to look at the canal, before taking the fast train down to the South West, arriving at 11:30am. I met up with Milly in the centre of town, for a brunch of pancakes and bacon at Boston’s Tea Party. Then we went on a little tour of Exeter’s charity shops, as we’re both charity shop fiends! 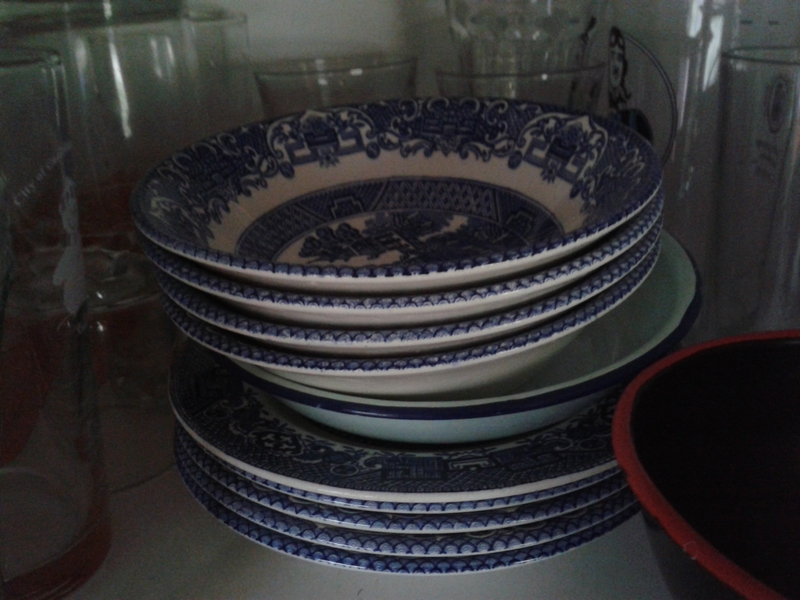 Milly bought a little bag and I picked up a couple of enamel bowls and a vest top. 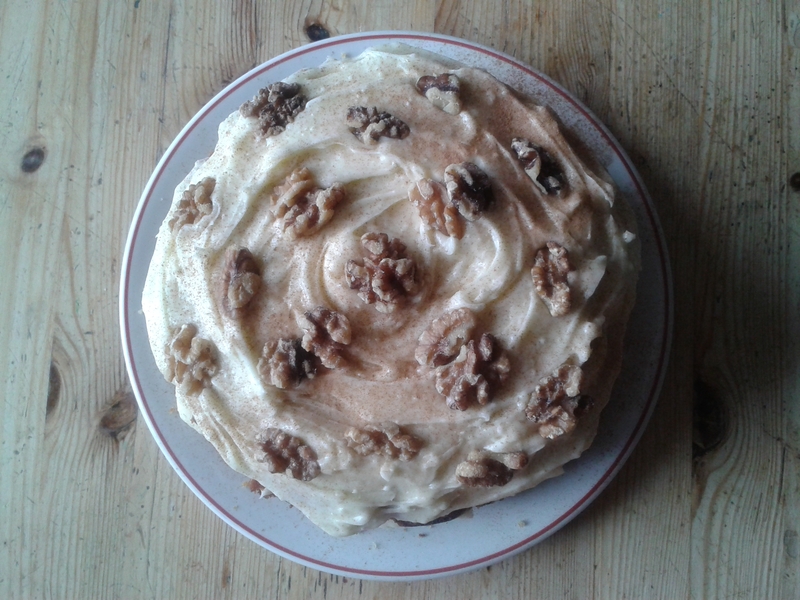 Back at my mum’s, we had tea and home made Hummingbird Bakery carrot cake with cream cheese frosting. Yum! 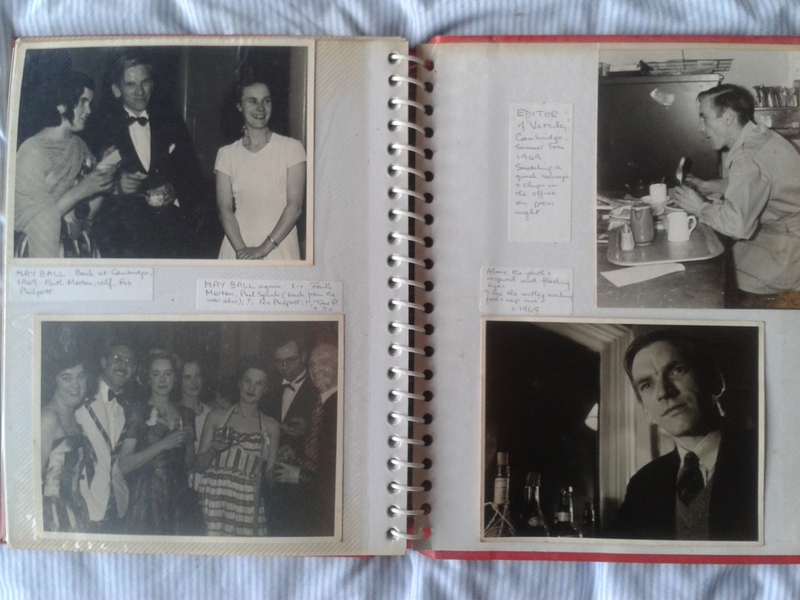 Afterwards, we dug out of the loft some journals which my grandfather Mike had made back in the early 90s ( he passed away in 1996). 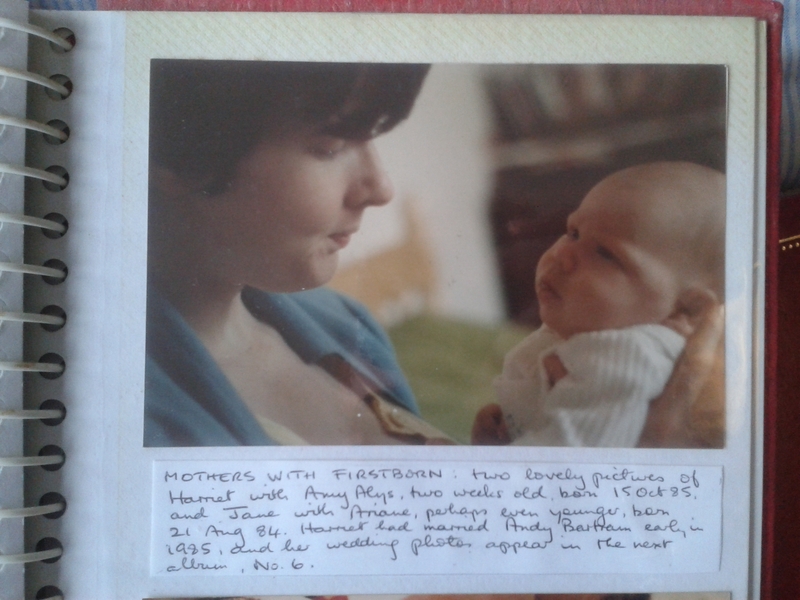 He had sat down with all his photos, drawings and memories and collated them into eight journals, with narrative captions setting out the story of his life. 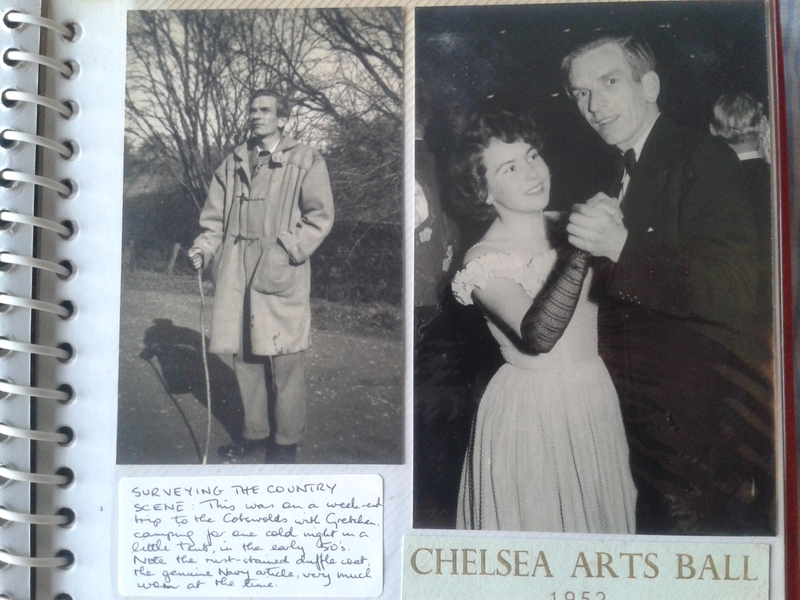 We enjoyed looking through them, seeing photos of my grandfather as a dashing young man at Selwyn College, Cambridge and in the war in North Africa, my grandma looking beautiful at a Chelsea Arts Ball in 1952, my mother and her sisters as children and teens in Cornwall, and then all the grandchildren, including my sisters and me. 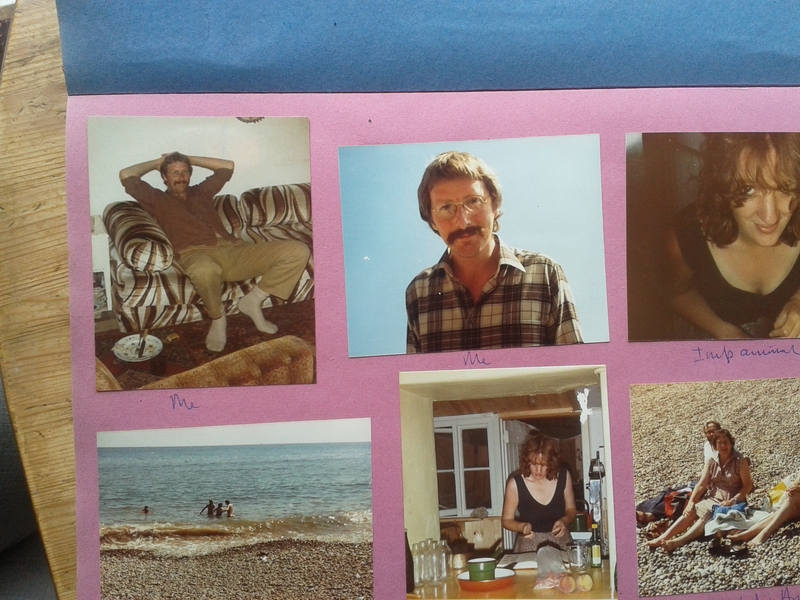 We also found a scrapbook of my dad’s photos from the early eighties, which was fun to look at too – he looksin some phots like an American archeologist and in others like a hippie Jesus! 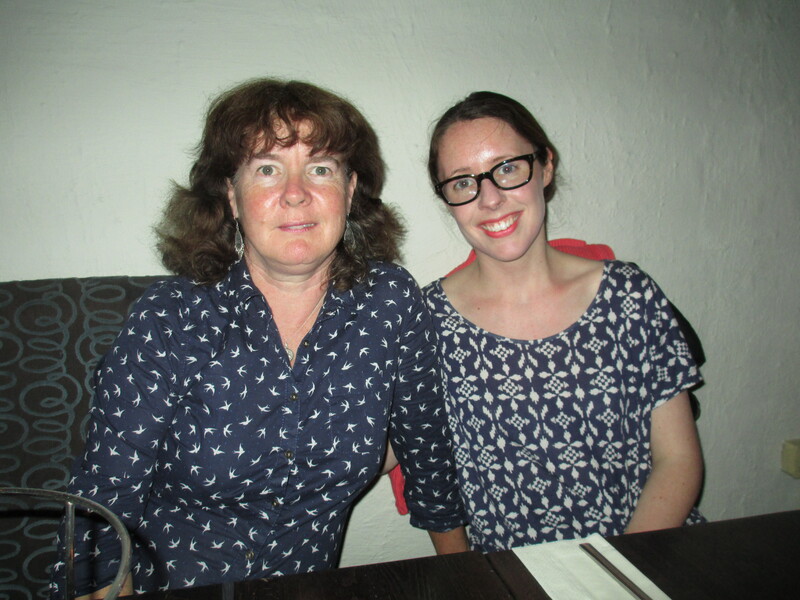 In the evening we went for dinner to celebrate my mum’s birthday at On the Waterfront , a restaurant built in the ground floor of a 19th century warehouse on Exeter’s quayfront. We shared some delicious pizzas before heading home to watch a French film about Edith Piaf to help with Esther’s revision! On Saturday, I got up early to make muffins for breakfast (not having an oven at home at the moment means that I had missed baking!). 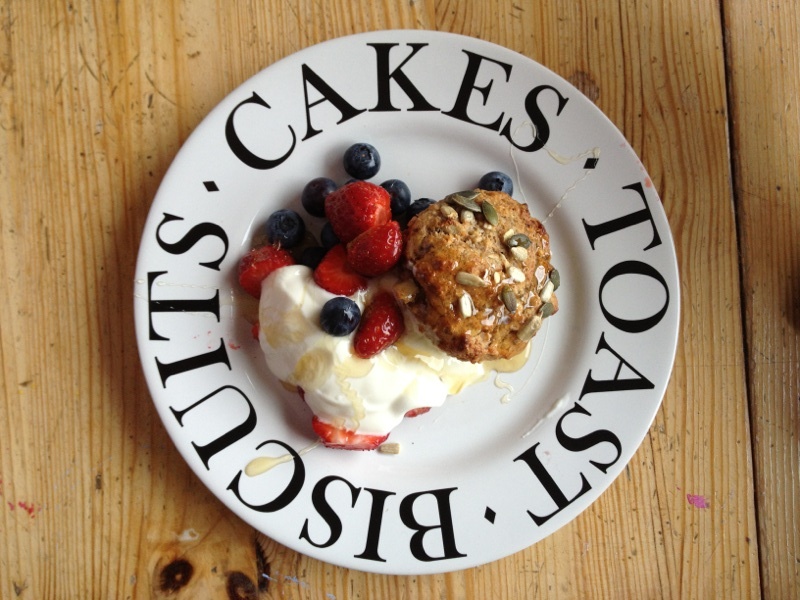 I made these ones, with no sugar, just honey, wholemeal flour, lots of seeds and fresh fruit. They were very quickly consumed! 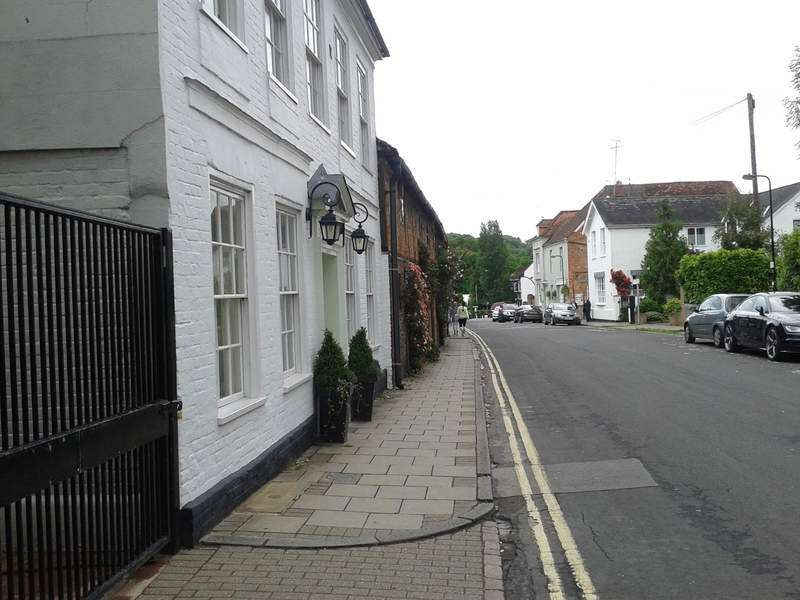 Later, my dad came over and Milly and I walked over with him to the Welcome Cafe (formerly the Welcome Inn, which was my grandfather’s, and later, my dad’s local.) We went to the antiques shop on the Quay, and I wished that I could have brought some of the furniture home on the train! 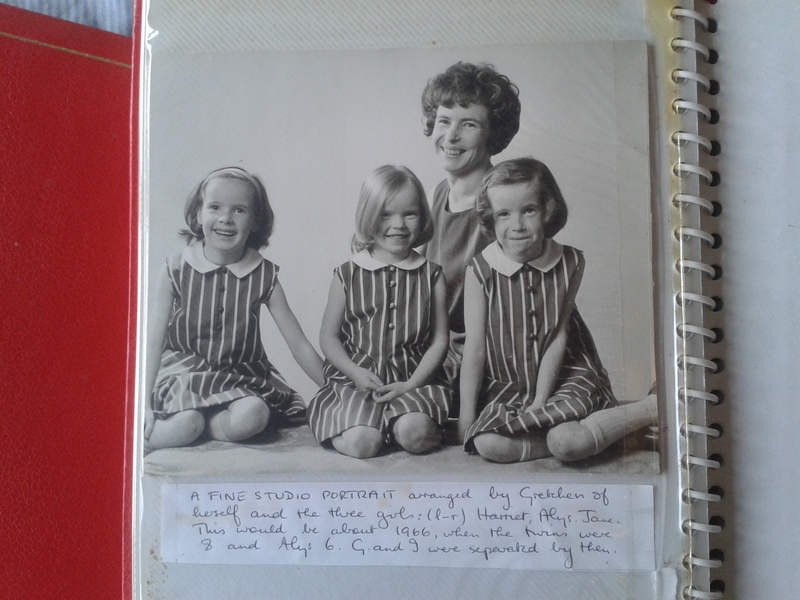 My dad had also brought with him a 1960s chart of the Severn which I didn’t know he had kept! We now have so many lovely charts that we’ll struggle to find room to put them all up! All too soon it was time to make a move and take the train back to Cambridge. I got back to find much progress in the bathroom, and will blog about that soon!